I did these nails while I was in the US. I brought zero tools, removers, polishes and cuticle care (yeah, smart of me) so I had to make do with whatever I bought. Which will also explain the bad nail job done below. I had just gotten a bottle of Sinful Colors - 24/7 and I really wanted to use it right away. 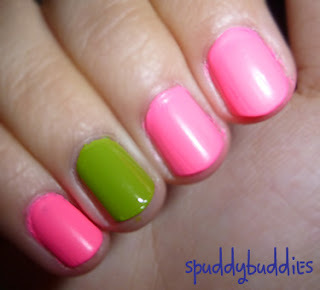 I'm wearing Sinful Colors - 24/7 and Sally Hansen - Lickety Lime Split. I really love Sinful Colors - 24/7. 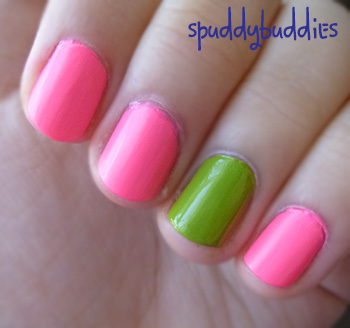 It's a gorgeous neon pink and the formula is just right. It dries semi-matte as you can see in the pictures but I prefer a glossy finish. Here I'm wearing two coats of both polishes. I hadn't bought any white polish yet so these are without a white base. I would definitely wear 24/7 over a white base to make the neon pop. 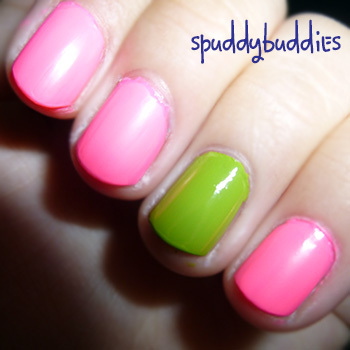 Or if you prefer a muted neon look, forgoing the white base is fine too. Hmm, yeah, there was flooding at my cuticles... I painted my nails on the bed so my hands were shaking... Not a smart thing to do but what's a girl to do when she's got new polish and no table to paint her nails at? I always have ugly ragged skin at my cuticles that I'm not sure what to do with. It's not the flaky dead skin that comes off when I push my cuticles back and if I don't kind of nip them, they'll just be there. Sometimes I just nip them, sometimes I leave them. Help? I tried Googling for solutions but none of them addressed this problem. Maybe I wash my hands too often? Or the water here is hard therefore creating skin near the cuticles? Or maybe I just don't moisturize my hands enough...? Gah, I probably need to invest in some cuticle oil. If you have any tips on how to get rid of the skin near the cuticles, pray tell.